Sikhs have been part of the British for a long time. Dates back to the days of the empire. (Something the British seem to think still exists). What is different is since July 2009 they are now members of the elite who guard the queen. So pay attention when you come visiting. Among the bearskins you will now catch a glimpse of blue turbans at Buckingham and Windsor palaces. I thought this was a non -London photograph. Anyway, I like this BLUE color and the way you have composed the photograph. Since blue is my favourite colour, good news! Next time I'm in London I'll look for the blue turbans! How interesting. I'm glad you told us about this because I'm sure I would have been confused if I had happened upon these guards with no explanation. 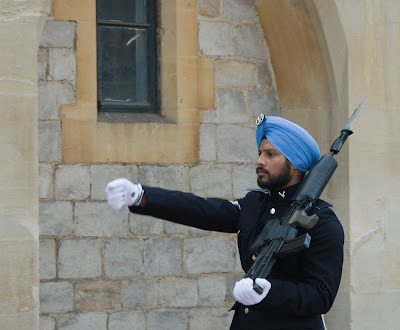 Have never seen a Sikh guard before and didn't know that there is still a regiment of them stationed here. Will look out for them the next time round. Thanks. ...and being a Brit I didn't even know that...shame on me! Oh the scandal! I left an Empire comment in the wrong box but you get the idea! It's a photo that leaves me struggling. My first thought was 'How smart compared with soldiers in bearskins (who look rather silly)'. Then I thought 'how fierce'. ('Smart' and 'fierce' seeming, somehow, to be connected.) Then I thought, 'perhaps it is better to look silly than fierce'. Then I thought 'it is sad to have to look silly when you could look smart' (and how I wish nobody had to be fierce). Then I realised I'd fallen, yet again, into a tangle of thoughts about war and defence and it all felt very painful . . . Which just shows what a good photo this is! Interesting sight. Sikhs and Ghurkhas, tough men. Wow...that's a great photo...the day we were there it was a Scottish regiment.